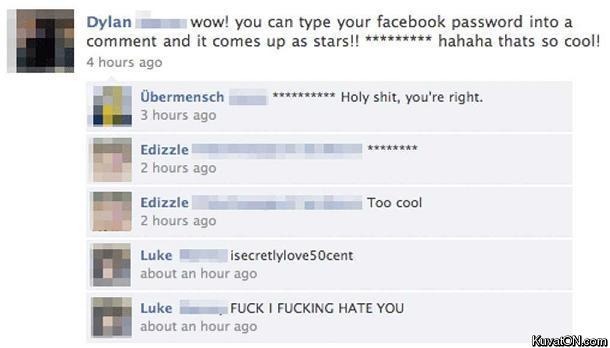 Have you tried typing your password into other places aside from the password section in Facebook before? Did you know that typing your password into Facebook, no matter where, like comment box or wall, something magical will happen? Apparently, Facebook has some sort of programming that will detect whenever your password is entered into public spaces such as walls or comment box and automatically converts it into asterisks to prevent any leaks of confidential information. Like *****. Check out the following picture below! Or apparently not. Like the "you won a free iPad" hoax, it's false. So please beware! What you see above is one of the typical cases where the good ol' viruses that takes hold of your friend's account and pretends to be your friend, sending out free iPads, iPhones, iTouch and i-it's-seriously-easy-to-cheat-you-guys-with-free-offers. Like my dad use to say, if something is too good to be true, like how your password is will magically turn into * when you type it out, it's probably false, even if you have 100 friends endorsing it. They're probably possessed by the viruses too already so please think twice before clicking on any links or trying anything that your common sense deem to be untrue! Among the ways where you can confirm whether a link or an action that your friend is asking you to click/do is true, check it out with your friend first. Drop him/her a message asking whether did he/she post the thing that you are seeing. Most of the time, it's not. These spybots, viruses and hackers are getting smarter and smarter each day with more advanced techniques to gain your trust. So please let common sense prevail! Always ask "Is this offer true or not?". By the way, the Luke is the picture is definitely not this Luke. And i have never love 50 Cent before. I much more prefer 100 Dollars. Who loves 50 Cent anyway?